Note: Currently no vacancies are to be filled within the framework of the Federal Voluntary Service. Criewen – the application round for a Voluntary Ecological Year (FÖJ) in the Lower Oder Valley National Park has begun. Interested young people between the ages of 18 and 26 can apply for an FÖJ spot. The service time is one year, generally performed at the National Park Administration in Criewen. The FÖJ is volunteer work and serves the transfer of knowledge and skills in environmental and nature conservation. It should provide young people with career orientation. In the Lower Oder Valley National Park, the “FÖJ’ers” gain valuable experience, for example, in practical area monitoring, cooperation in the recording of plant and animal species and, last but not least, at the National Park House and other locations. Participation in event organisation and environmental education at the newly built Natura 2000 site offers many opportunities to discover and use creative and communicative skills as well as contribute your own ideas. 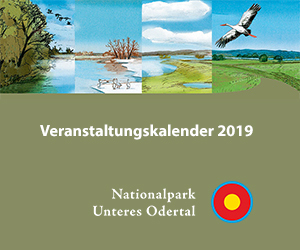 Information is available to those interested at the Lower Oder Valley National Park Administration under the telephone number +49 (0) 3332 2677200.